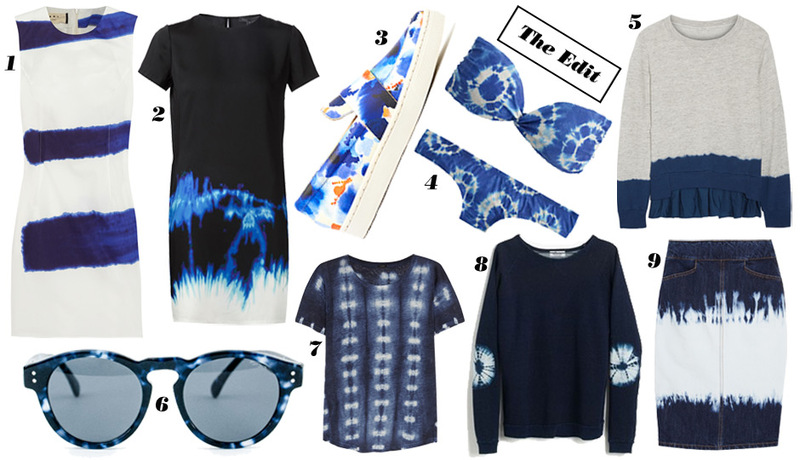 Tie-dye gets a bad rap for evoking more memories of childhood summer camp than a fashion-forward print. But the new generation of tie-dye is anything but juvenile. It’s popping up in universally flattering indigo and in unexpected places like the elbows of sleeves and denim pencil skirts. As for that rainbow-hued Dave Matthews Band tee you’ve been holding onto? Well, maybe it’s best kept in your dresser. Marni Printed Poplin Dress, $320.40 at The Outnet. Tie Dye Short Sleeve Satin Dress, $395 at Vince. Irini Slip-On Sneaker, $275 at Loeffler Randall. Tie Dye Bandeau Top, $$39.99 and Hipster, $39.99 at J.Crew. CLU Ruffled Sweatshirt, $340 at Net-a-Porter. Komono Crrafted Series Sunglasses, $110 at Omoi Zakka. J.Crew Linen T-Shirt, $50 at Net-a-Porter. Almond Surfboards Shibori Sweatshirt, $125 at Madewell. Etoile Isabel Marant Perrine Skirt, $128.25 at The Outnet.